Ionospheric disturbances pose, for instance, an increasing risk on economy, national security, satellite and airline operations, communications networks and the navigation systems. Constructing forecasted ionospheric products with a reliable accuracy is still an ongoing challenge. 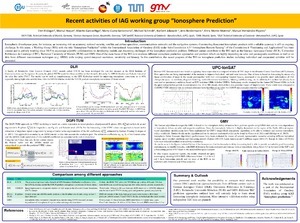 In this sense, a Working Group (WG) with the title “Ionosphere Prediction” within the International Association of Geodesy (IAG) under Sub-Commission 4.3 “Atmosphere Remote Sensing” of the Commission 4 “Positioning and Applications” has been created and is actively working since 2015 to encourage scientific collaborations on developing models and discussing challenges of the ionosphere prediction problem. Different centers contribute to the WG such as the German Aerospace Center (DLR), Universitat Politècnica de Catalunya (UPC), Technical University of Munich (TUM) and GMV. One of the main focus of the WG is to evaluate different ionosphere prediction approaches and products which are highly depending on solar and geomagnetic conditions as well as on data from different measurement techniques (e.g. GNSS) with varying spatial-temporal resolution, sensitivity and latency. In this contribution, the recent progress of the WG on ionosphere prediction studies including individual and cooperated activities will be presented. Erdogan, E., Hoque, M., Garcia-Rigo, A., Cueto, M., Schmidt, M., Jakowski, N., Berdermann, J., Monte, E., Hernandez, M. Recent activities of IAG working group “Ionosphere Prediction”. A: European Geosciences Union General Assembly. "EGU2018: European Geosciences Union General Assembly: Viena, Austria: April 8-13, 2018: proceedings Book". 2018.